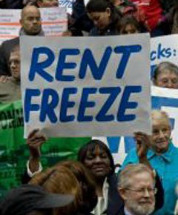 With a mayor who campaigned for a rent freeze, and with fair-minded appointees now on the RGB, we can make 2014 the year of the Rent Freeze!There has never been a rent freeze before. For decades, the Rent Guidelines Board has ignored rising rents and housing instability in NYC without consequence. 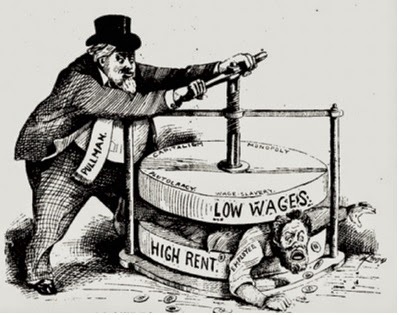 Testify at the June 16 Rent Guidelines Board hearing, 2-6 pm, Emigrant Savings Bank Building, 49-51 Chambers St.
and at the FINAL VOTE on June 23 at Cooper Union. Read Tim Collins' testimony and come to an RGB hearing! You should testify too! Click here for how, when and where. Let's freeze (or roll back) rents this year! The Rent Guidelines Board (RGB) can vote to roll back or freeze rents for struggling tenants after years of increasing profits for landlords. Tenants demanded meetings in every borough - and we got them. So let's fill those hearing rooms! Click here for a flyer in English or Spanish. On Thursday, April 24th, Mayor Bill De Blasio named Rachel Godsil as the new chair of the NYC Rent Guidelines Board. This happened just in time to have a full board meeting on Monday. Mayor de Blasio called for a rent freeze on the campaign trail last year. But we know that 2.5 million tenants have been hit with increase after increase while landlords made money hand over fist, and many New Yorkers can't afford rent right now. That’s why we’re calling for a RENT ROLLBACK on May 5 when the Rent Guidelines Board has its preliminary vote on rent adjustments for the approximately one million rent stabilized apartments in NYC. We need heavy turnout if we're going to make an impact on the board. The landlords are expected to be there in force. Help us fill the auditorium and join us for a victory rally after the vote. R3 groups and allies have been active over the last few weeks on a number of campaigns. Here are a few announcements: if you'd like to see your announcements and press listed here (and we missed them), email us atilana@metcouncilonhousing.org. AirBnBhas received a number of black-eyes in the press thanks to HCC and other allies. HCC slammed AirBnB in the NY Observer, while the Working Families Party, Real Affordability for All campaign, and Met Council piled on with press hits from the NY Times, the NY Daily News, and Channel 7's Eyewitness News.